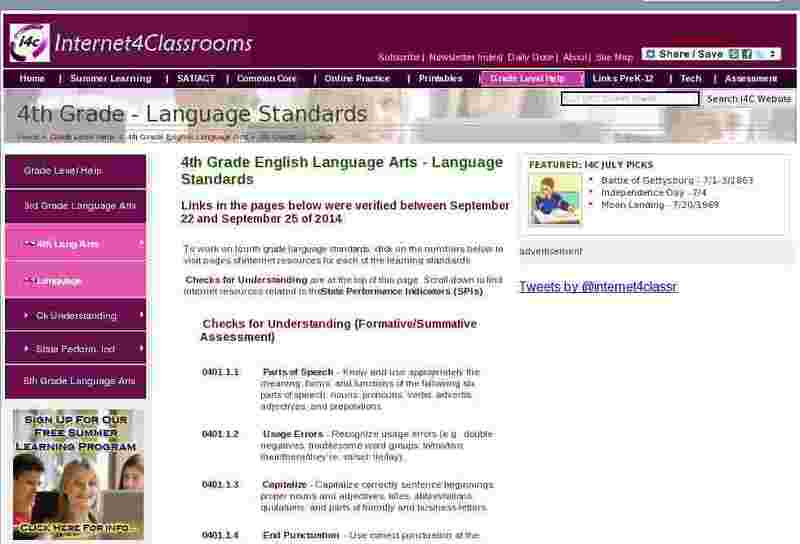 To work on fourth grade language standards, click on the numbers below to visit pages of internet resources for each of the learning standards. 0401.1.1 Parts of Speech - Know and use appropriately the meaning, forms, and functions of the following six parts of speech: nouns, pronouns, verbs, adverbs, adjectives, and prepositions. 0401.1.2 Usage Errors - Recognize usage errors (e.g., double negatives, troublesome word groups: to/too/two; their/there/they're; sit/set; lie/lay). 0401.1.3 Capitalize - Capitalize correctly sentence beginnings, proper nouns and adjectives, titles, abbreviations, quotations, and parts of friendly and business letters. 0401.1.4 End Punctuation - Use correct punctuation at the ends of sentences. 0401.1.5 Commas - Demonstrate the correct usage of commas (e.g.., series, direct address, following introductory words, dates, addresses, quotations, letters, and compound sentences). 0401.1.6 Correct Quotation Marks - Demonstrate the correct usage of quotation marks (e.g., in direct quotations and in titles). 0401.1.7 Spell Correctly - Spell correctly high-frequency and commonly misspelled words appropriate to grade level. 0401.1.8 Using Apostrophe - Form and spell correctly contractions, plurals, and possessives. 0401.1.9 Abbreviate - Abbreviate words correctly. 0401.1.10 Spell - Spell correctly words commonly used in content specific vocabulary. 0401.1.11 Write Legibly - Write legibly in manuscript and cursive. 0401.1.12 Language Structure - Use appropriate language structure in oral and written communication (e.g., subject-verb agreement in simple and compound sentences, correct word order within a sentence, correct placement of detailed words and phrases). 0401.1.13 Complete Sentences - Use complete sentences in writing. 0401.1.14 Incomplete Sentences - Recognize and edit incomplete sentences and run-on sentences. 0401.1.16 Synonyms, Antonyms, and Homonyms - Define and recognize word synonyms, antonyms, and homonyms. 0401.1.17 Word Consciousness - Continue to develop word consciousness (e.g., word play, word walls, word sorts). 0401.1.18 Unfamiliar Words - Use a variety of previously learned strategies (e.g., roots and affixes, context, reference sources) to determine the meaning of unfamiliar words. SPI 0401.1.1 Nouns and Pronouns - Identify the correct use of nouns (i.e., common and proper, plurals, possessives) and pronouns (i.e., subject, object, and agreement) within context. SPI 0401.1.2 Verb Usage - Identify the correct use of verbs (i.e., agreement, tenses, action and linking) within context. SPI 0401.1.3 Adjectives and Adverbs - Identify the correct use of adjectives (i.e., comparison forms and articles) and adverbs (i.e., comparison forms and negatives) within context. SPI 0401.1.4 End Marks - Identify declarative, interrogative, and exclamatory sentences by recognizing appropriate end marks. SPI 0401.1.5 Correct Sentences - Select the best way to correct incomplete sentences within context. SPI 0401.1.6 Comma Usage - Identify the correct use of commas (i.e., series, dates, addresses, friendly letters, introductory words, compound sentences) within context. SPI 0401.1.7 Troublesome Words - Recognize usage errors occurring within context (i.e., double negatives, troublesome words: to/too/two, their/there/they're, its/it's). SPI 0401.1.8 Spelling Errors - Identify correctly or incorrectly spelled words in context. SPI 0401.1.9 Apostrophe Usage - Choose the correct formation of plurals, contractions, and possessives within context. SPI 0401.1.10 Quotation Marks - Choose the correct use of quotation marks and commas in direct quotations. SPI 0401.1.11 Subject-Verb Agreement - Identify sentences with correct subject-verb agreement (person and number). SPI 0401.1.12 Antonyms, Homonyms, and Synonyms - Select appropriate antonyms, synonyms, and homonyms within context. SPI 0401.1.13 Grade Appropriate Vocabulary - Recognize and use grade appropriate vocabulary within context. SPI 0401.1.14 Root Words - Use prefixes, suffixes, and root words as aids in determining meaning within context. SPI 0401.1.15 Compound Words - Identify grade level compound words, contractions, and common abbreviations within context. SPI 0401.1.16 Determine Meaning - Determine the meaning of unfamiliar words using context clues, dictionaries, and glossaries.